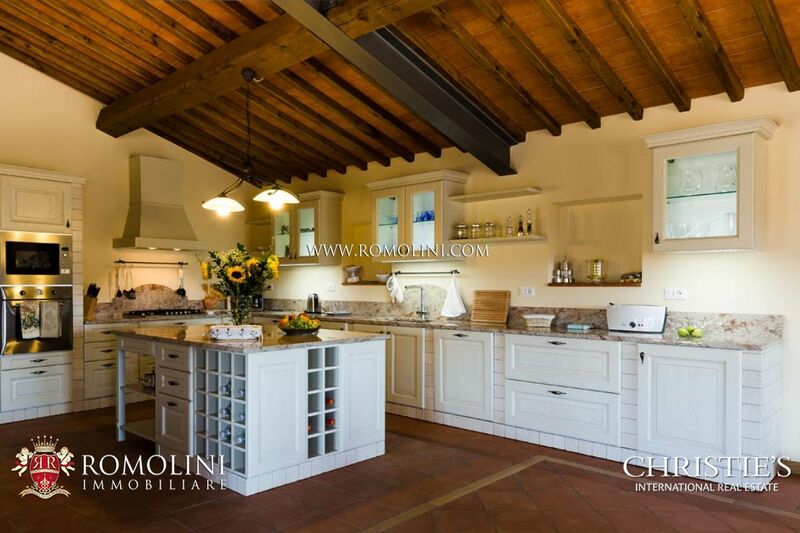 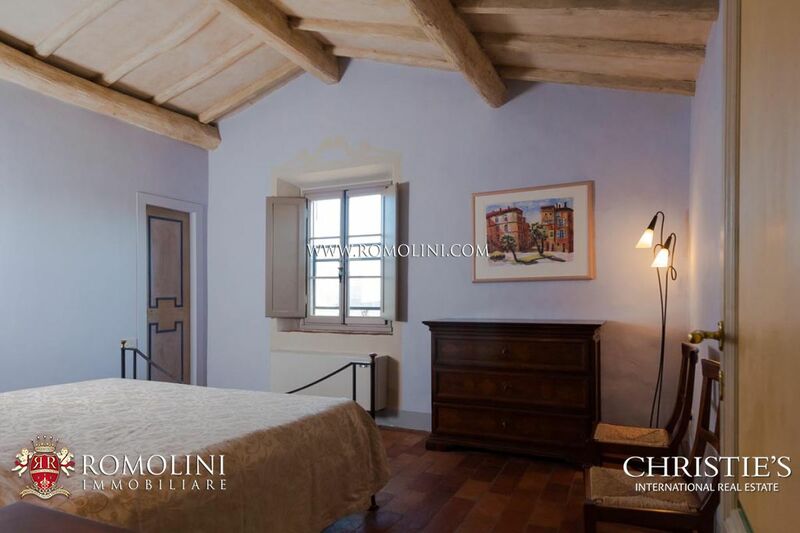 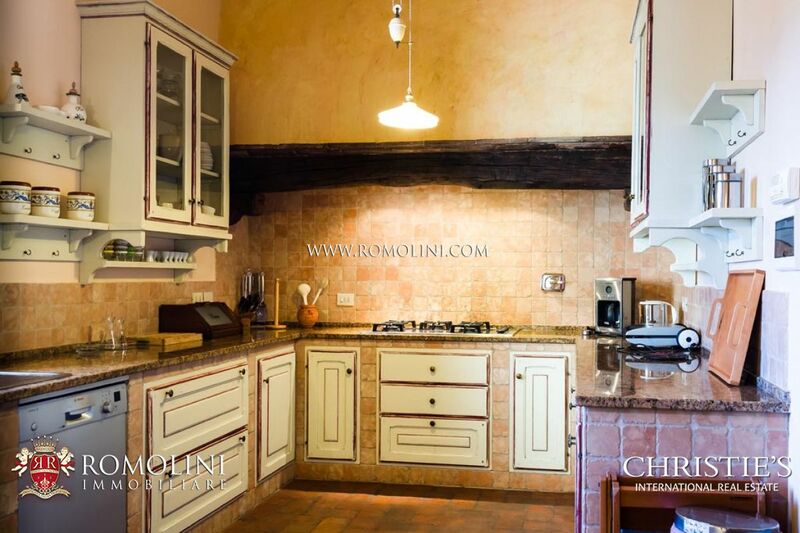 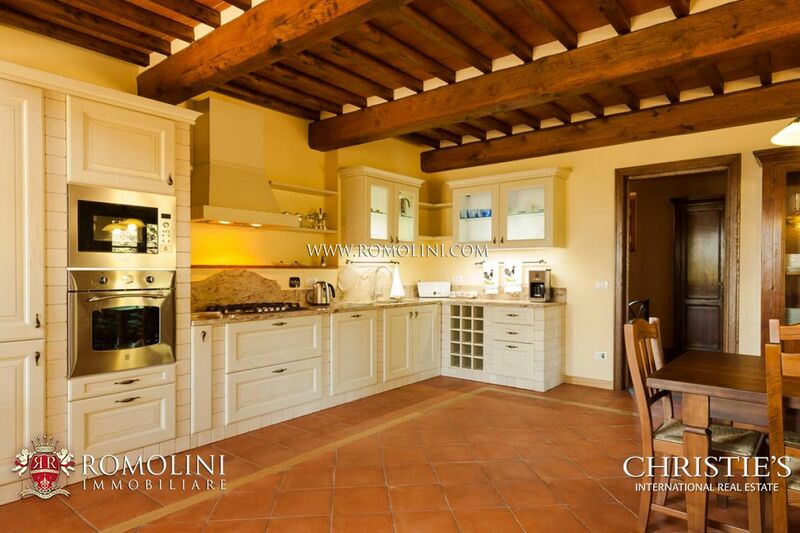 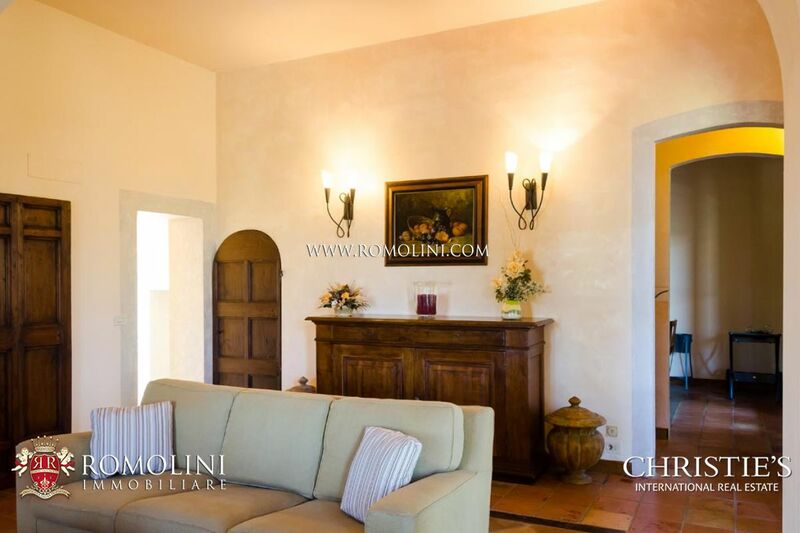 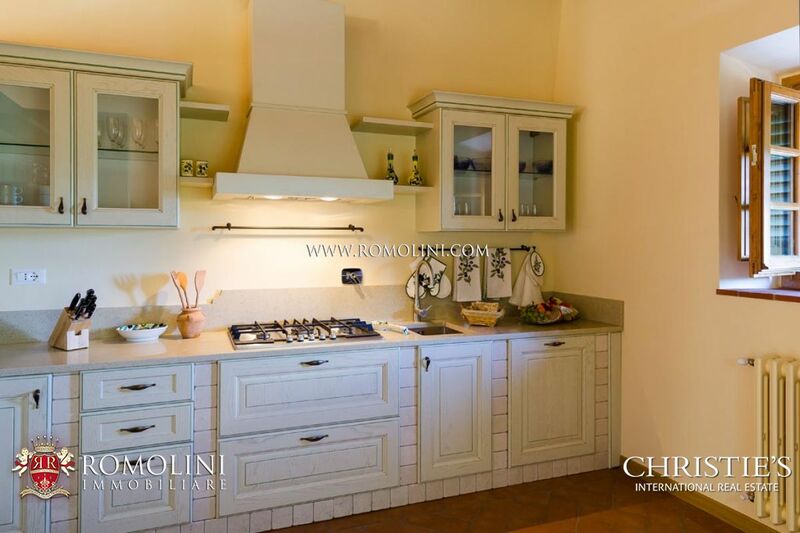 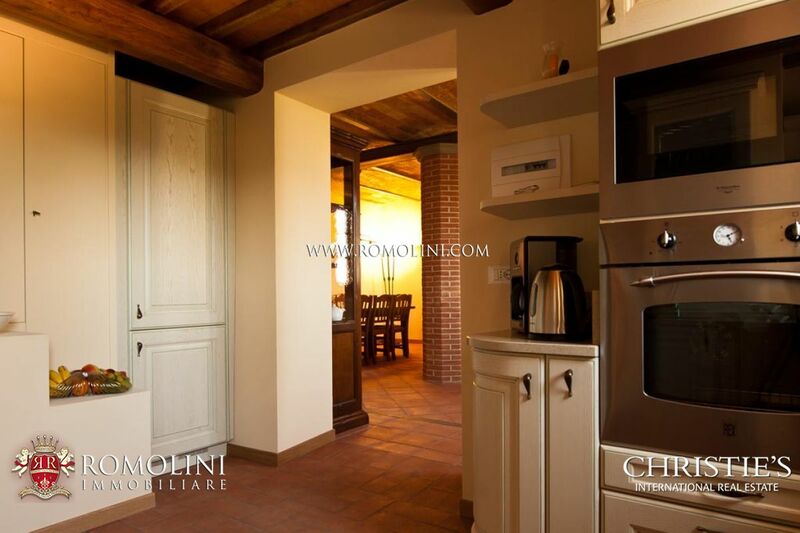 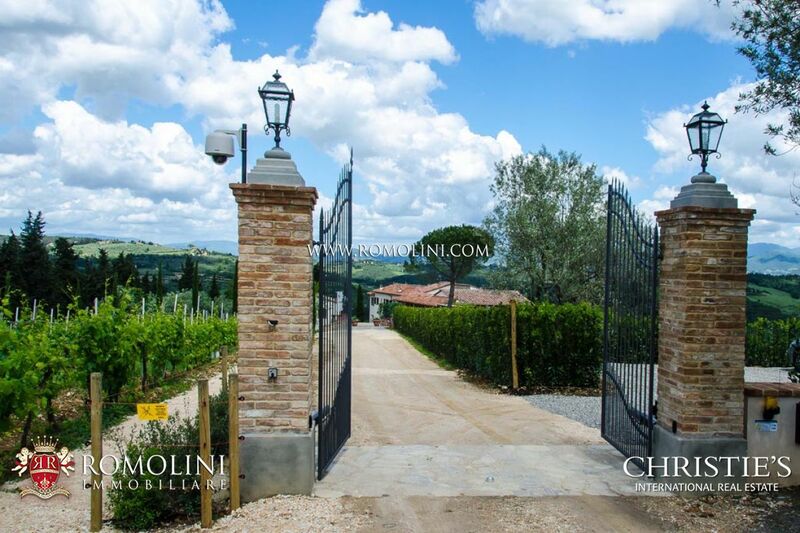 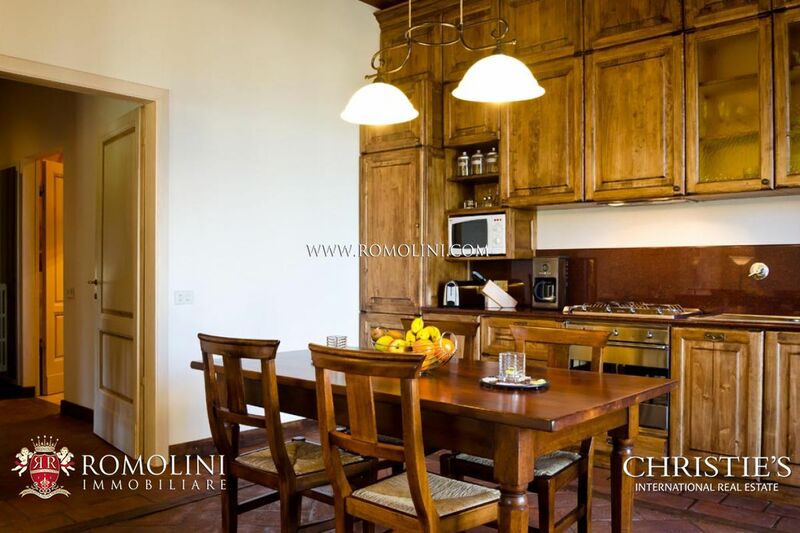 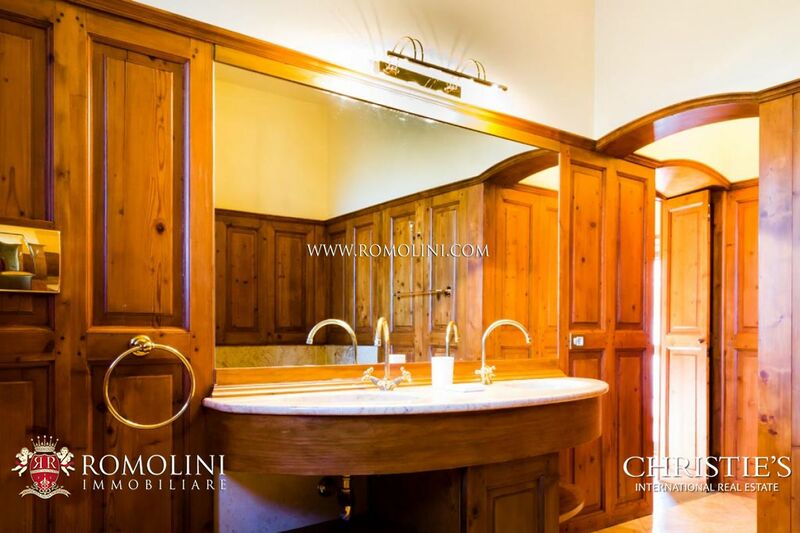 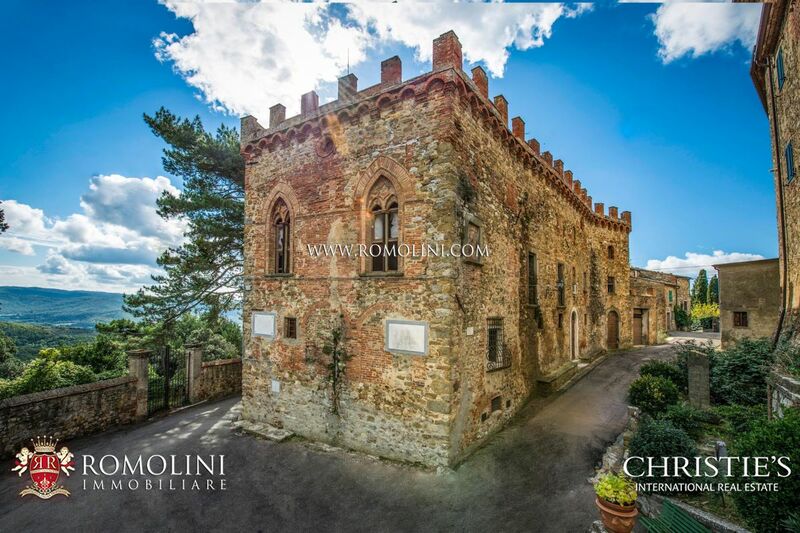 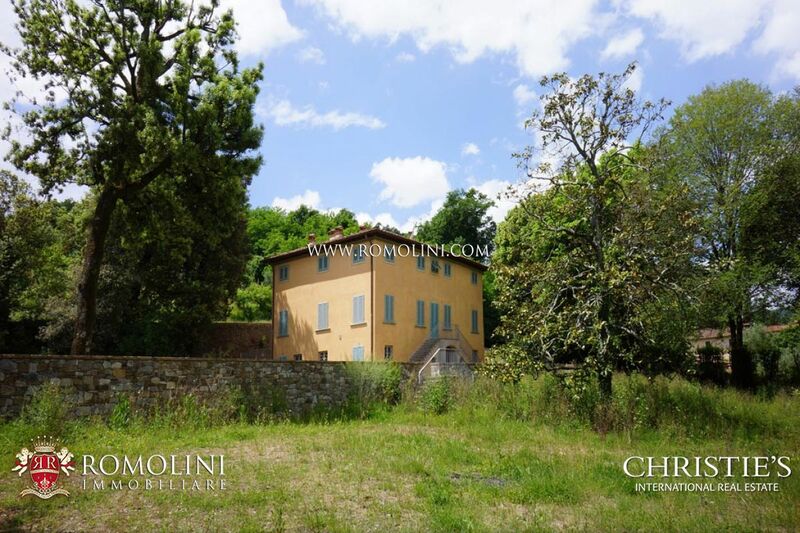 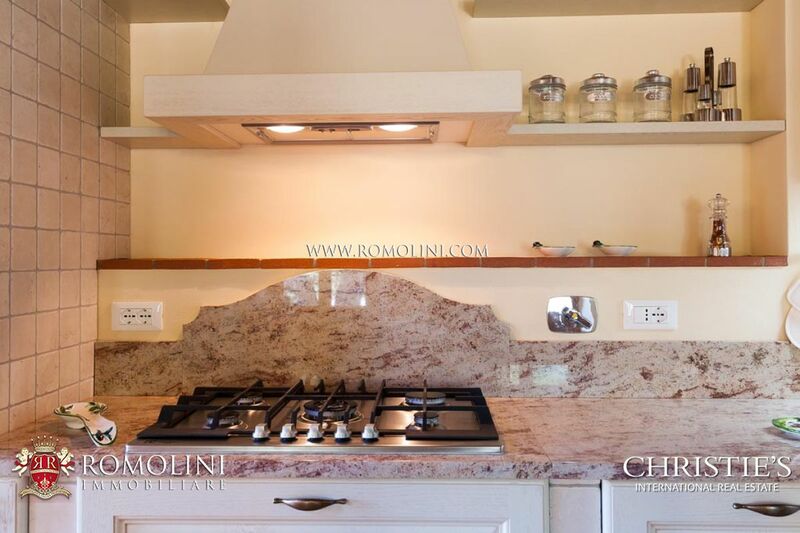 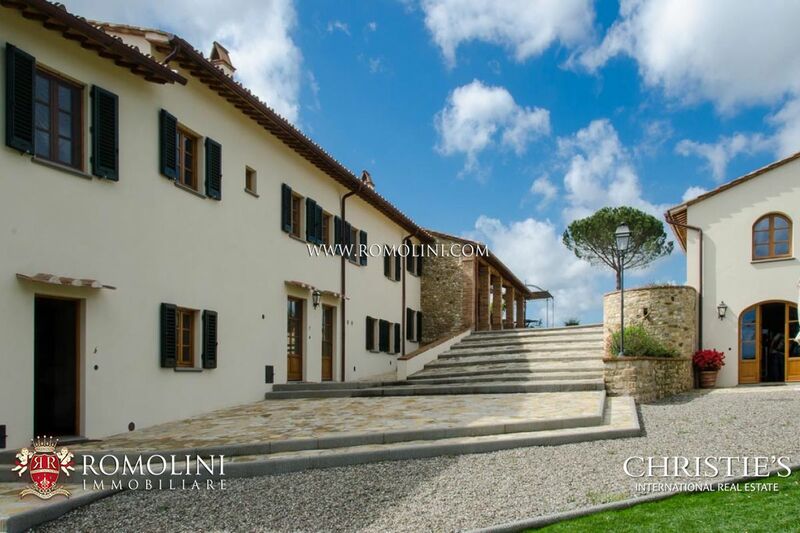 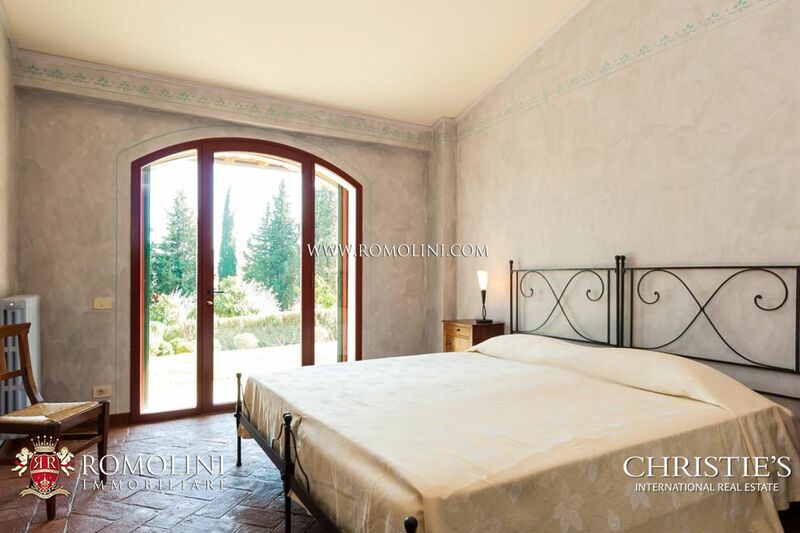 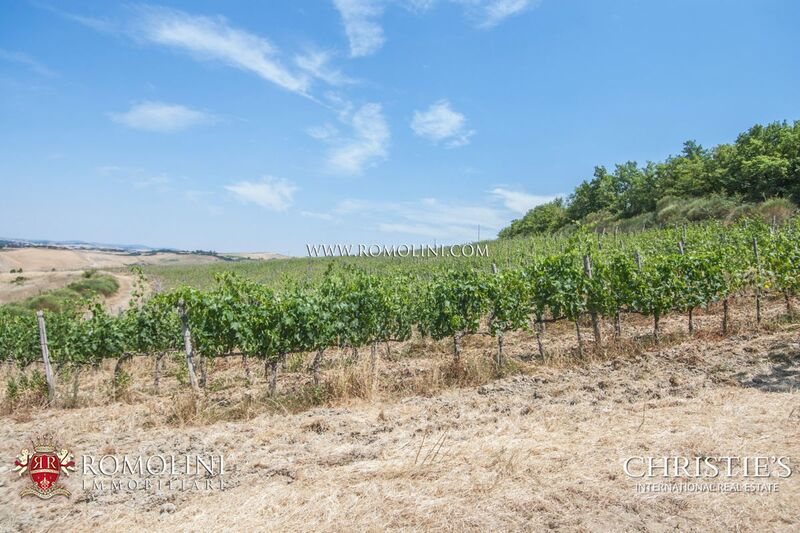 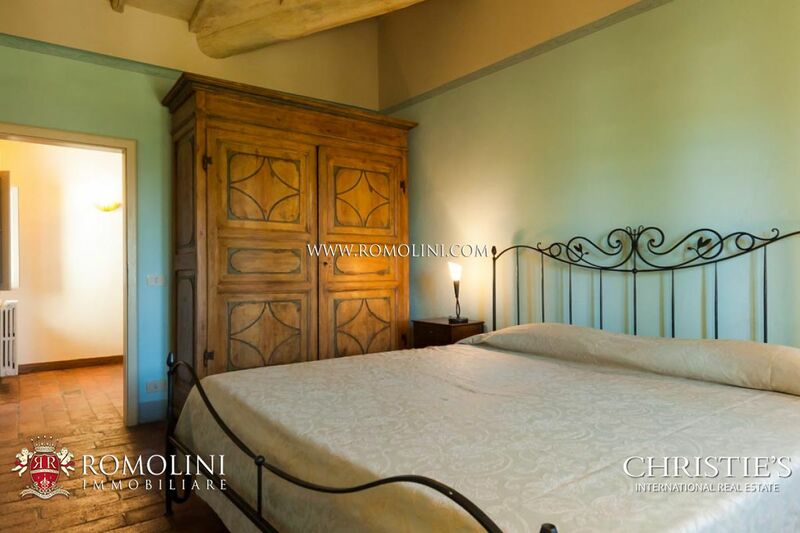 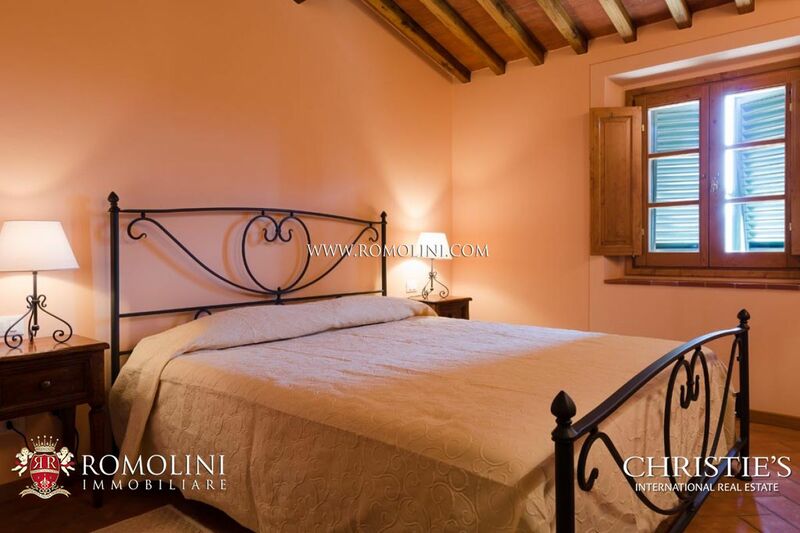 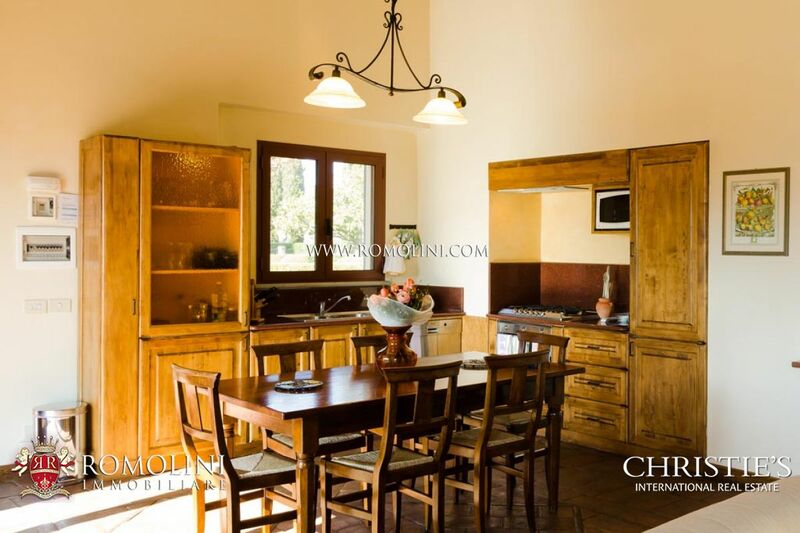 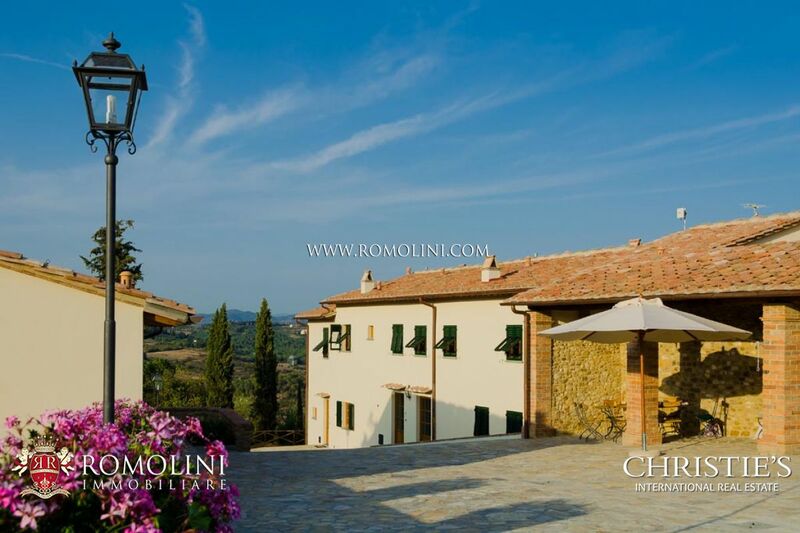 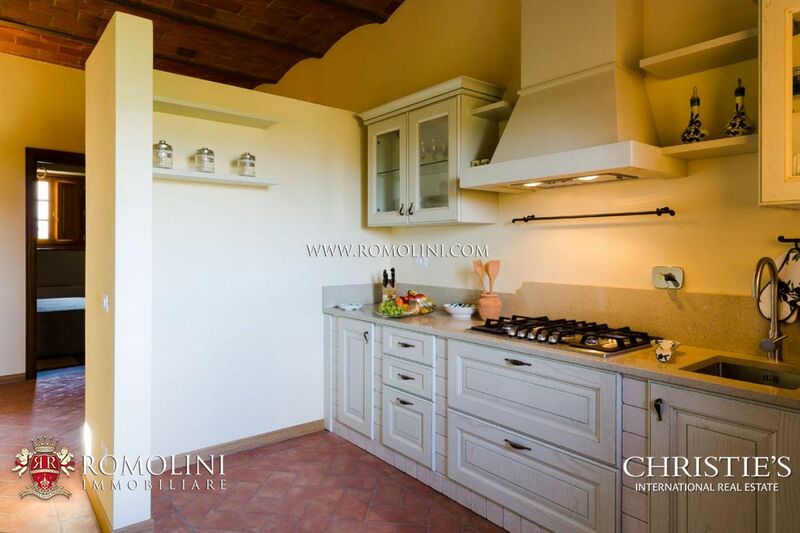 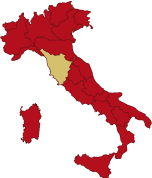 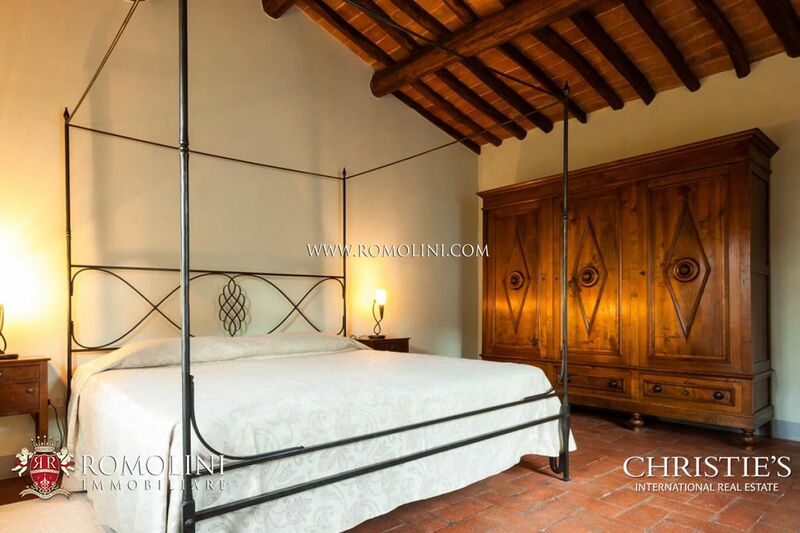 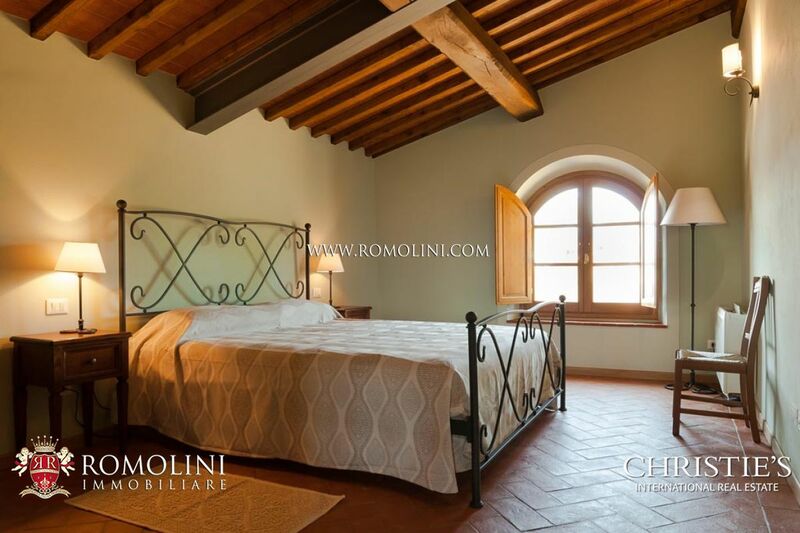 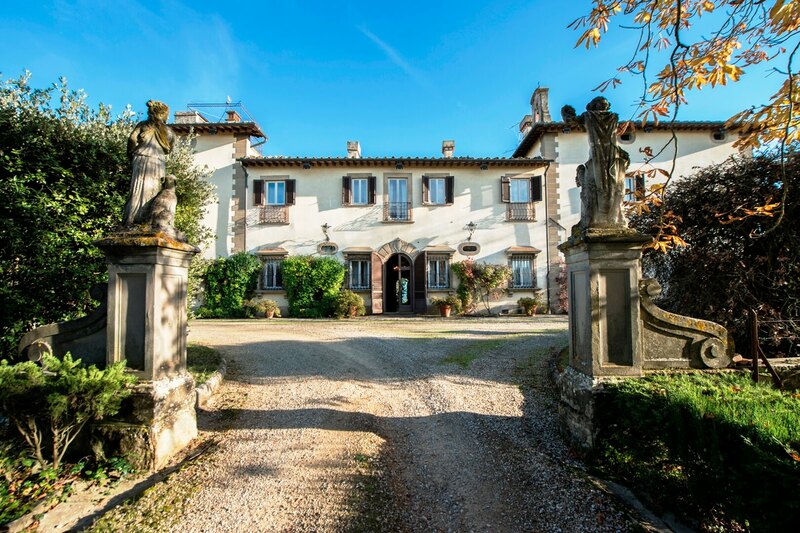 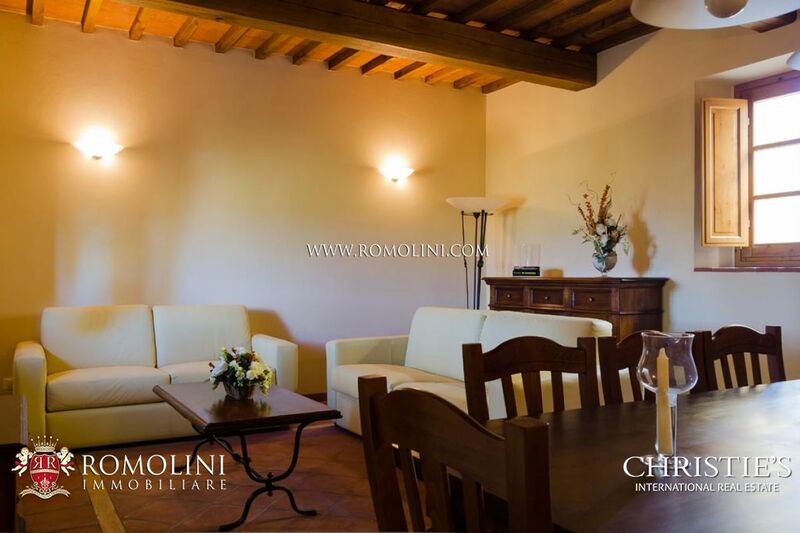 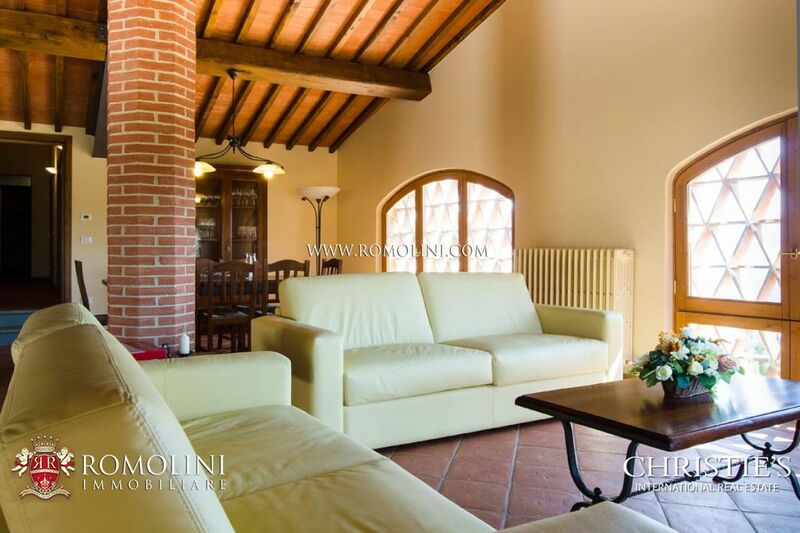 At the border between Val di Pesa and Val di Greve, among the hills of the Chianti Classico, in one of the most renowned and elegant areas of Tuscany, estate with private villa and ancient farm divided into apartments with private park, vineyard and olive grove. 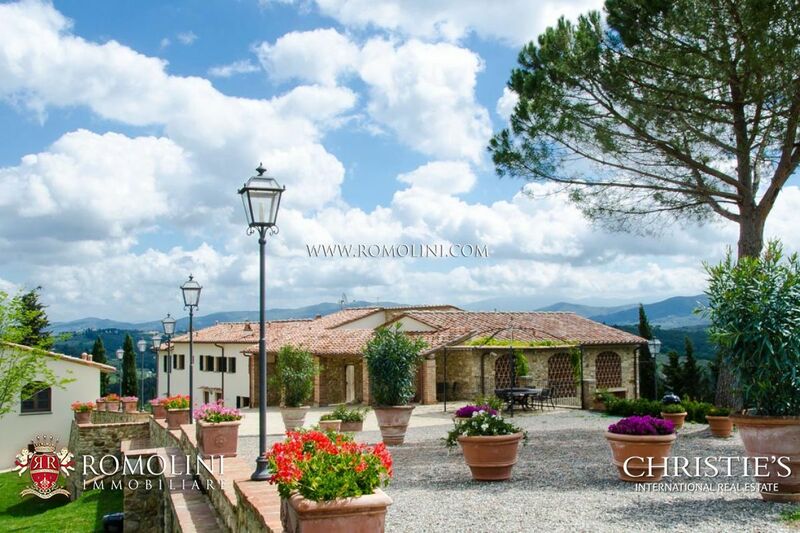 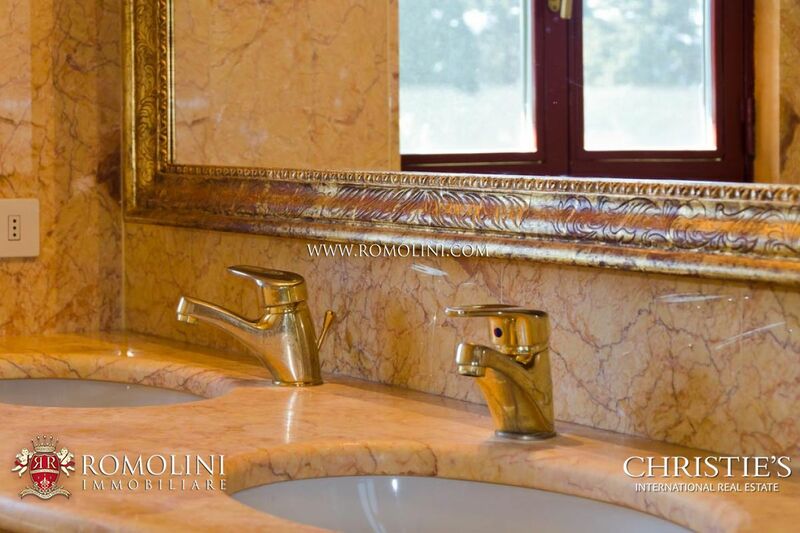 The estate is composed of two luxury buildings, described as follows. 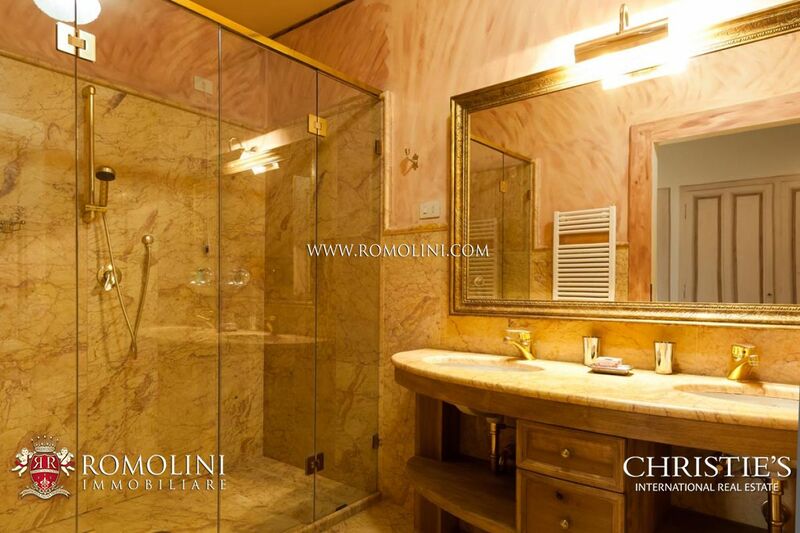 The habitable surface is of 715 sqm (or 7697 sqft). 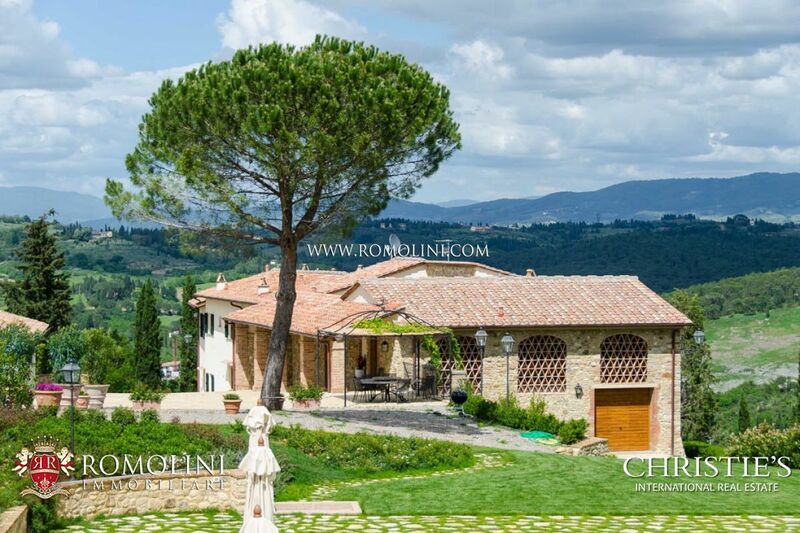 The property is accessed from a cypress-lined avenue. 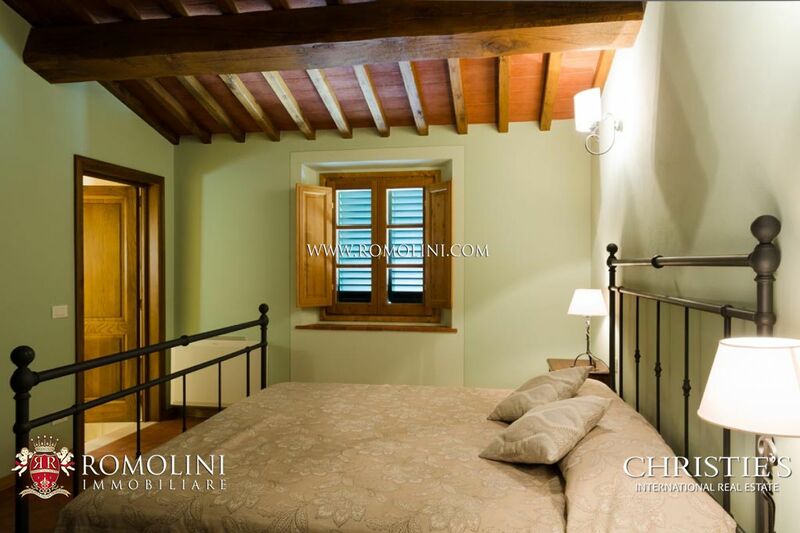 The small villa (130 sqm) is disposed on two levels. 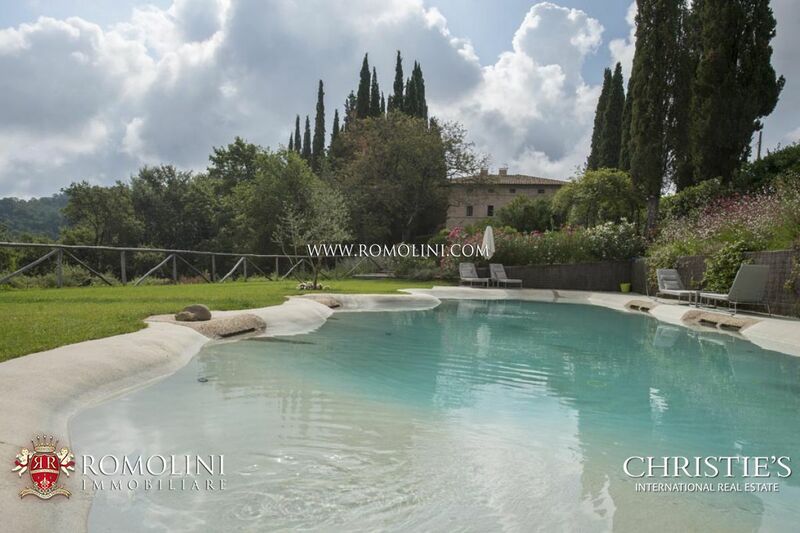 The farm (585 sqm) is restored and is in perfect condition. 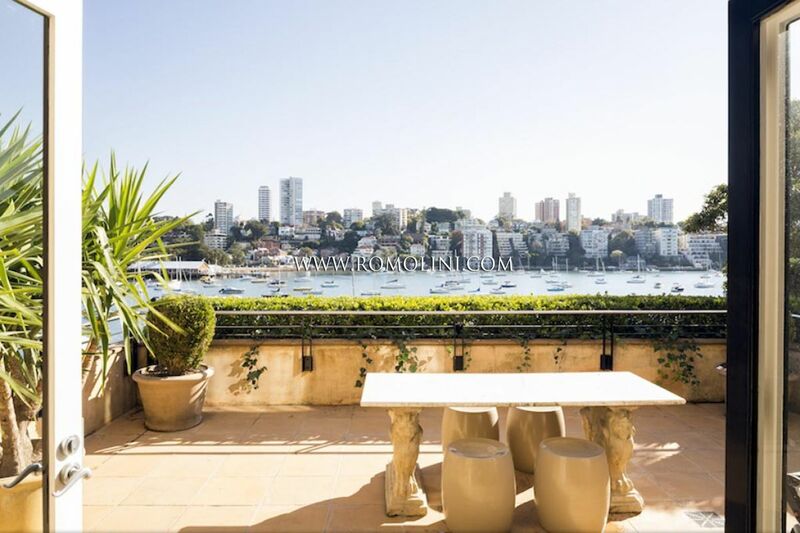 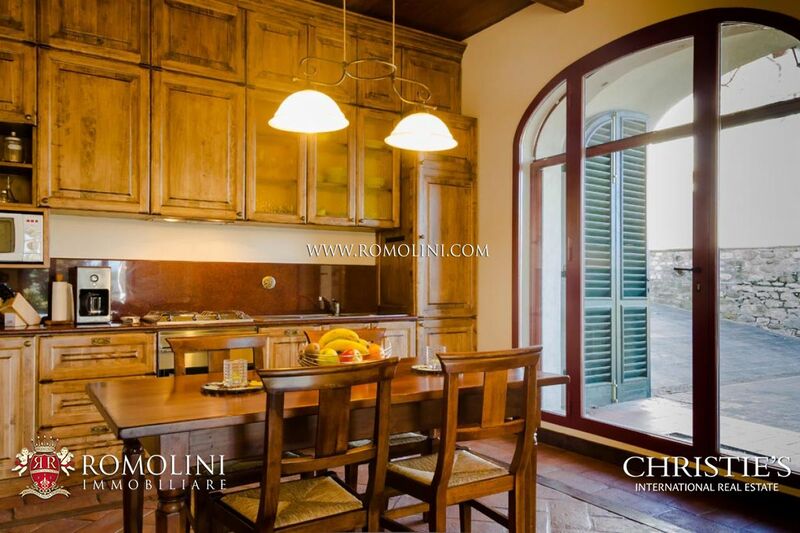 It is divided into four apartments, each of which is equipped with garden, terrace and parking area. 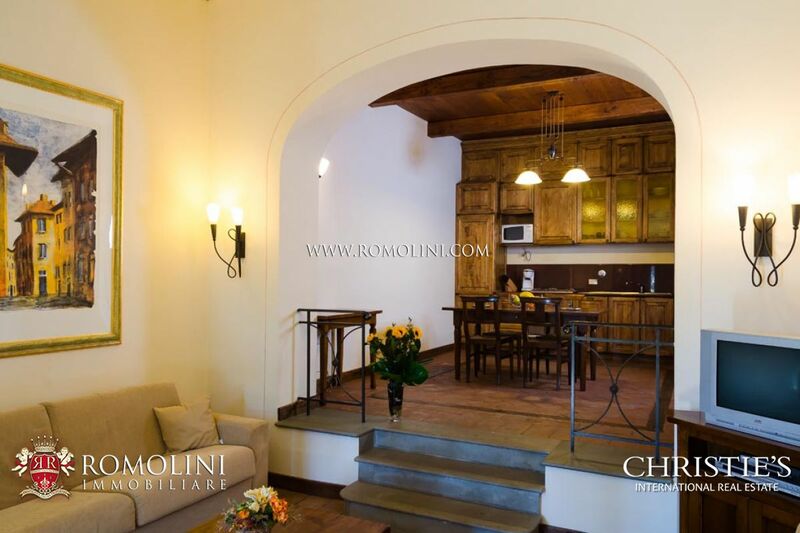 - Apartment N°1 (168 sqm) includes internal courtyard, large living room with vaulted windows, kitchen, dining room, three bedrooms, two marble bathrooms, sitting room and hallway. 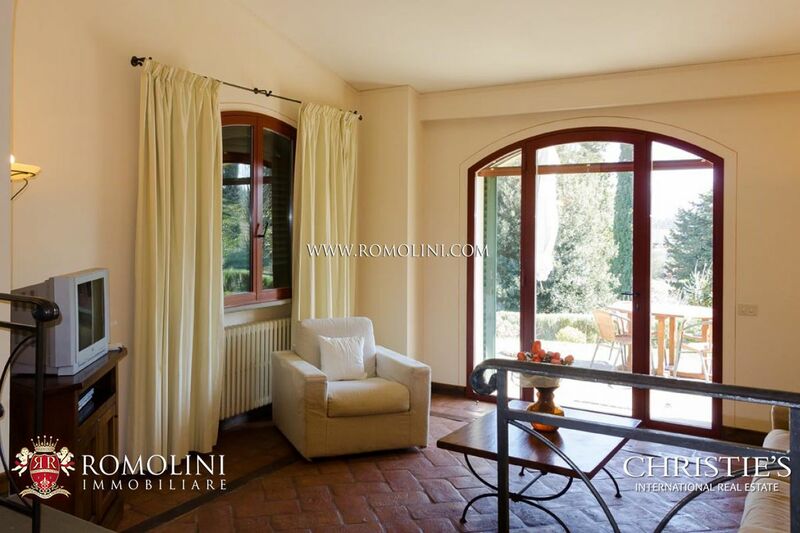 In front of the apartment there is a loggia and a pergola. 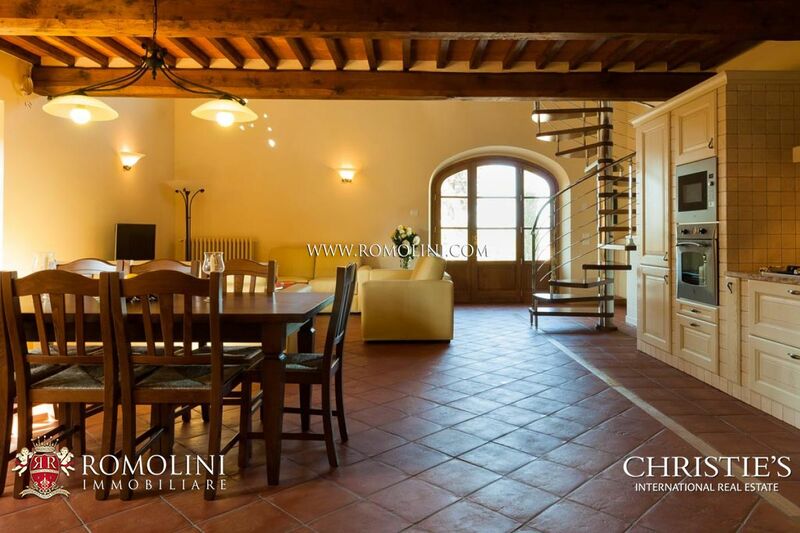 - Apartment N°2 (142 sqm) is divide into two floors. 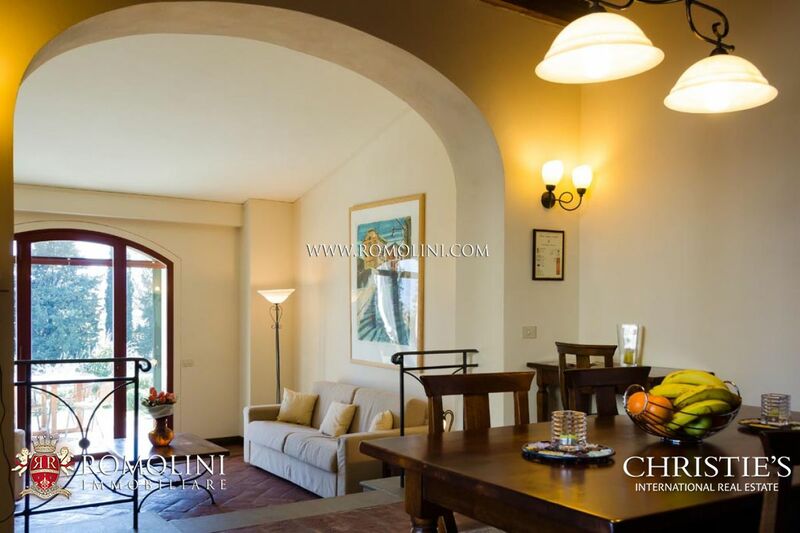 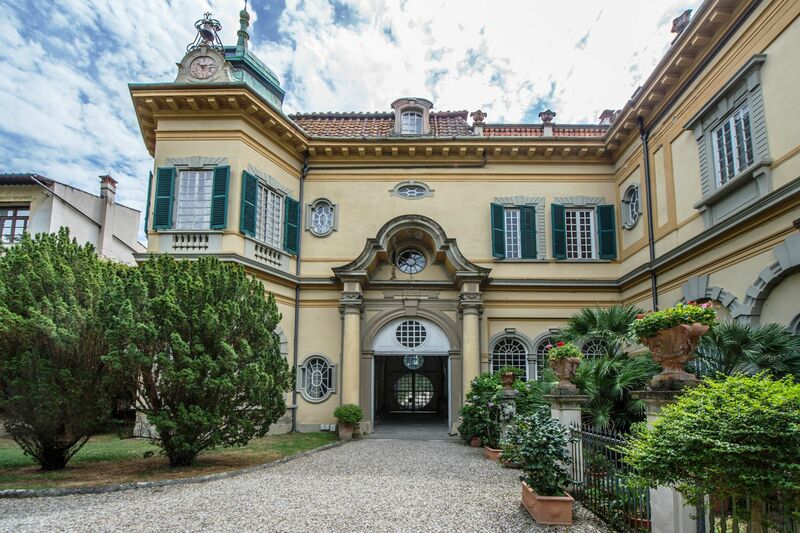 On the ground floor there is an internal courtyard accessible from a secular loggia, entrance, kitchen, living room with dining room, two bedrooms, two marble bathrooms. 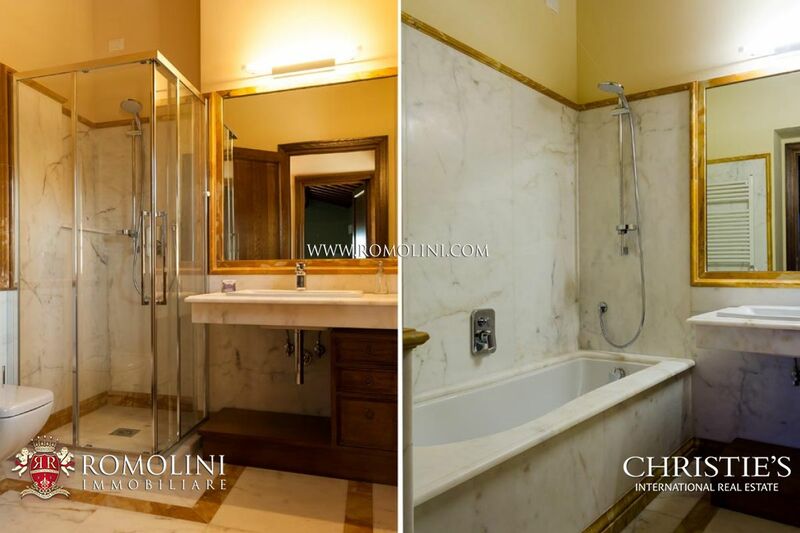 On the first floor there is a bedroom and marble bathroom. 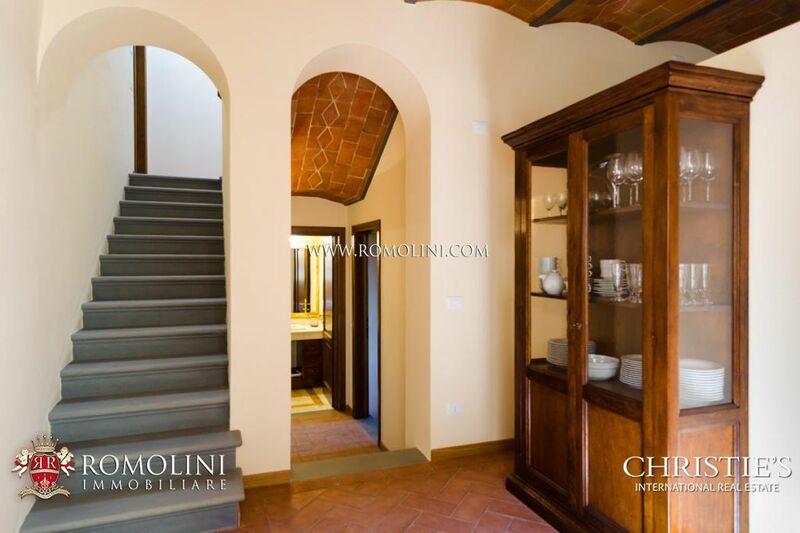 The apartment can be accessed from the stone staircase leading to a small terrace. 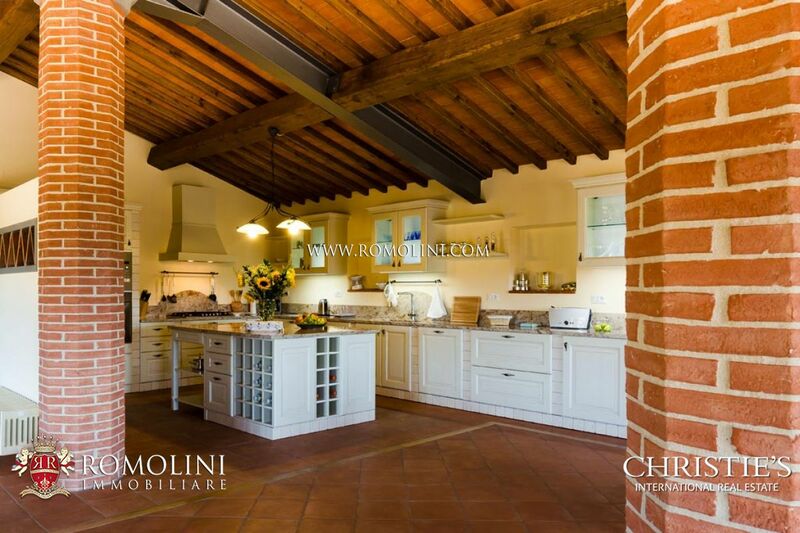 Outside there is a covered terrace with pergola. 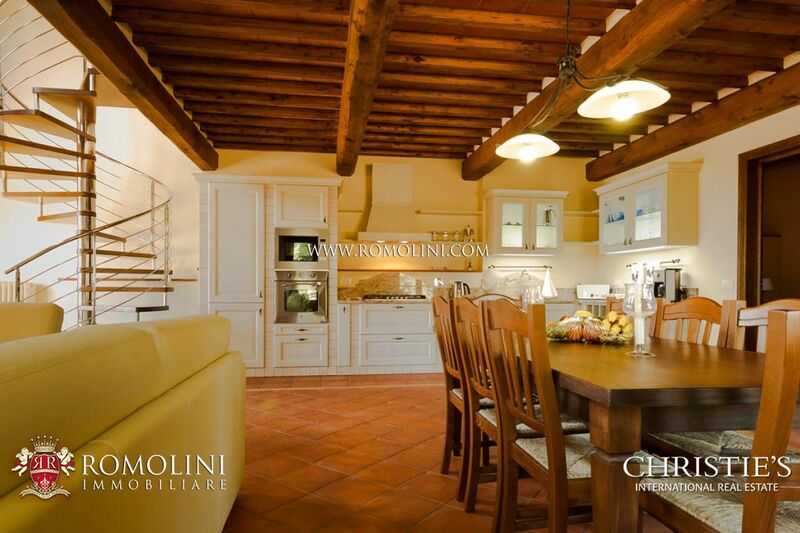 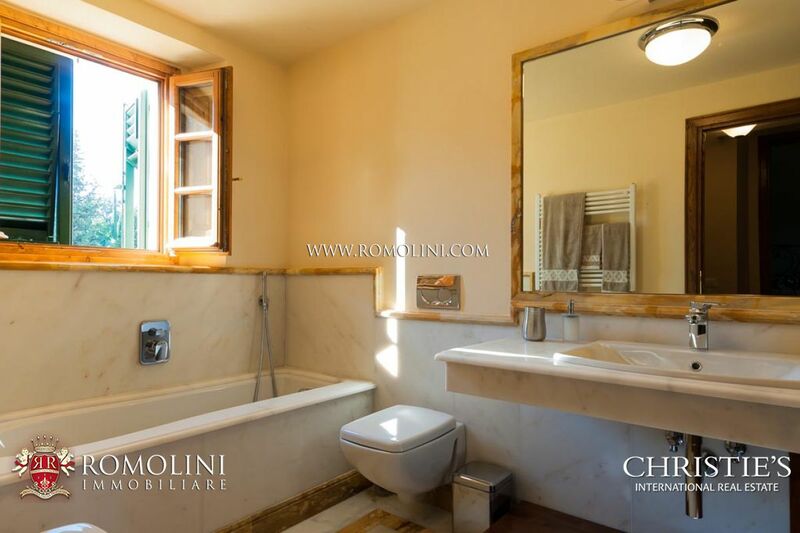 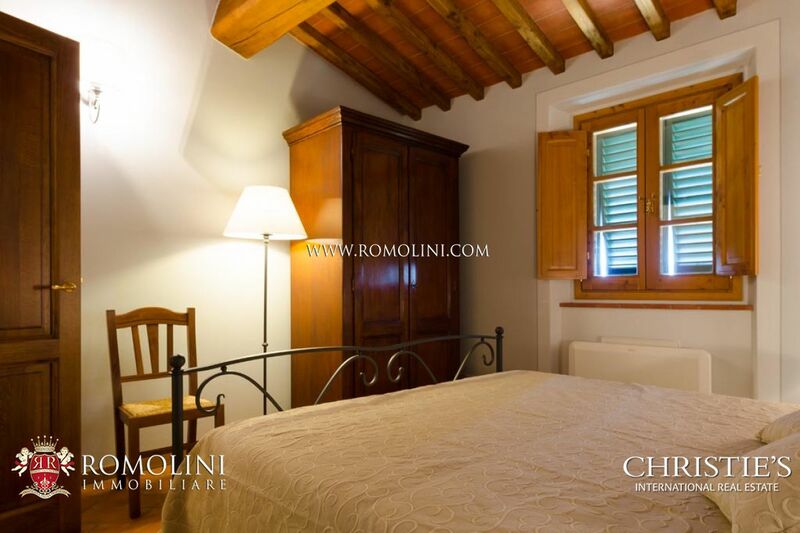 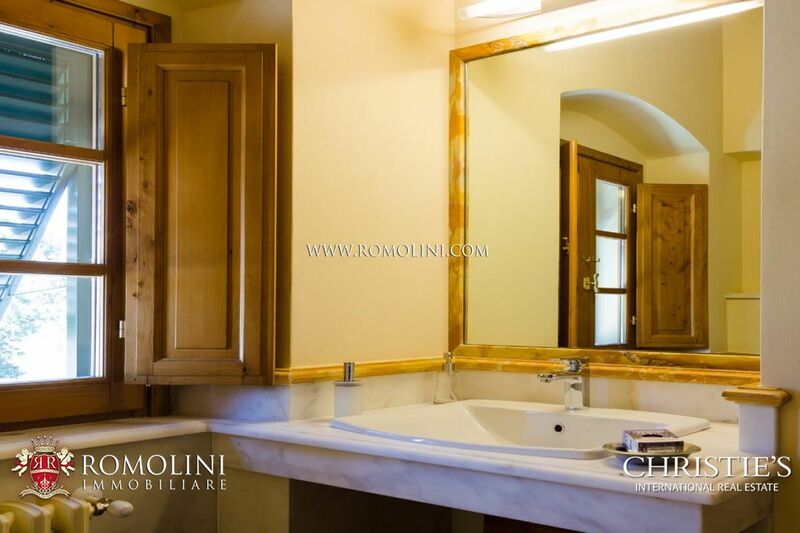 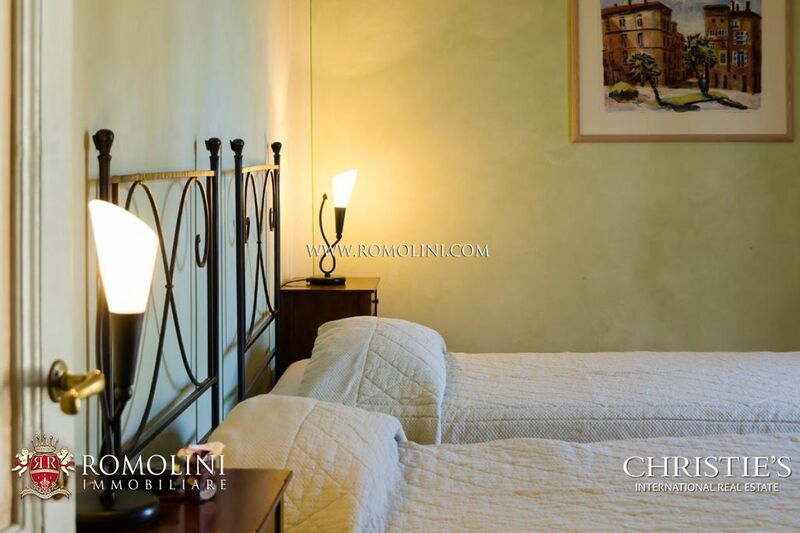 - Apartment N°3 (161 sqm) is set on two floors. 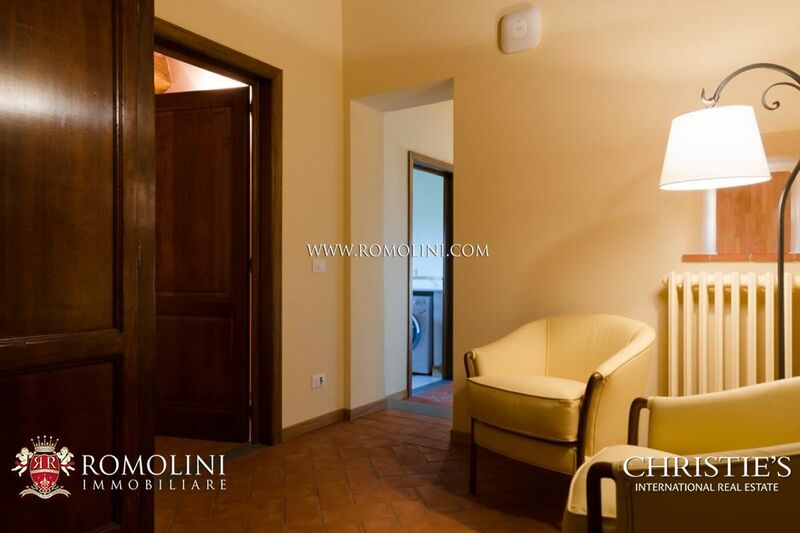 On the ground floor there is entrance hall, dining room with sitting room, built-in kitchen and toilet. 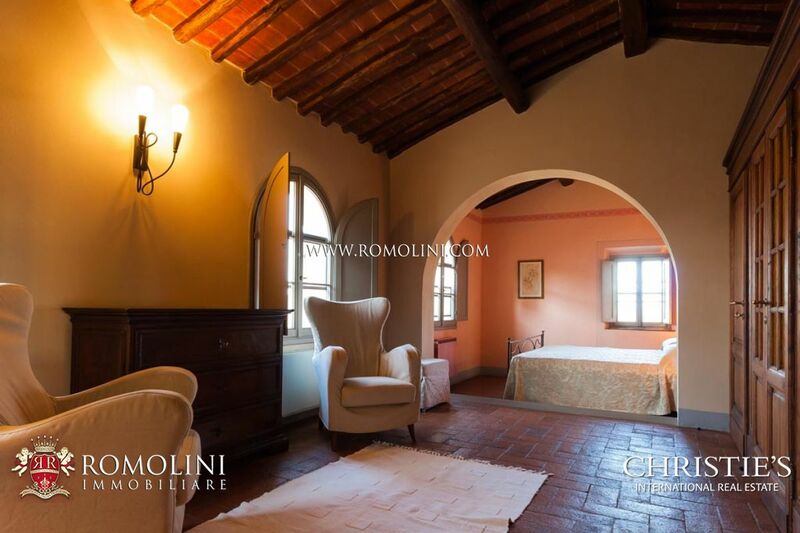 On the first floor there is a romantic suite with sitting area, two bedrooms and two bathrooms. 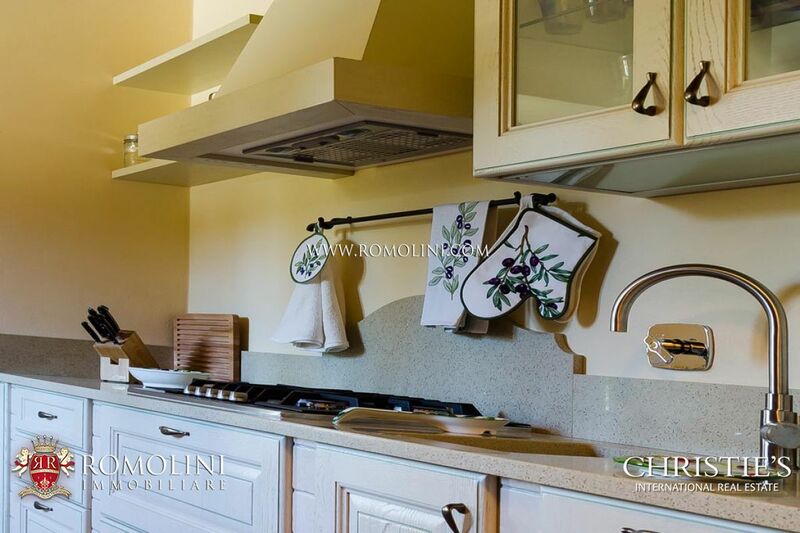 - Apartment N°4 (114 sqm) is disposed on two levels. 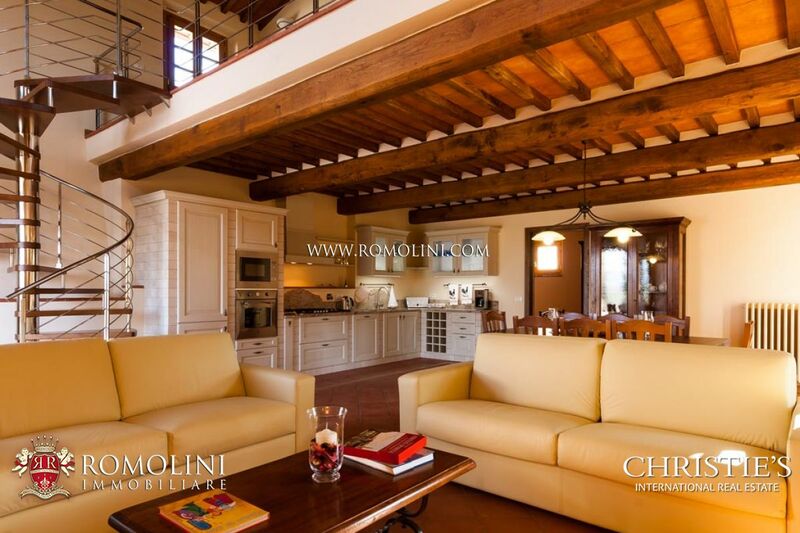 On the ground floor there is a large living room with dining area, kitchen and bathroom. 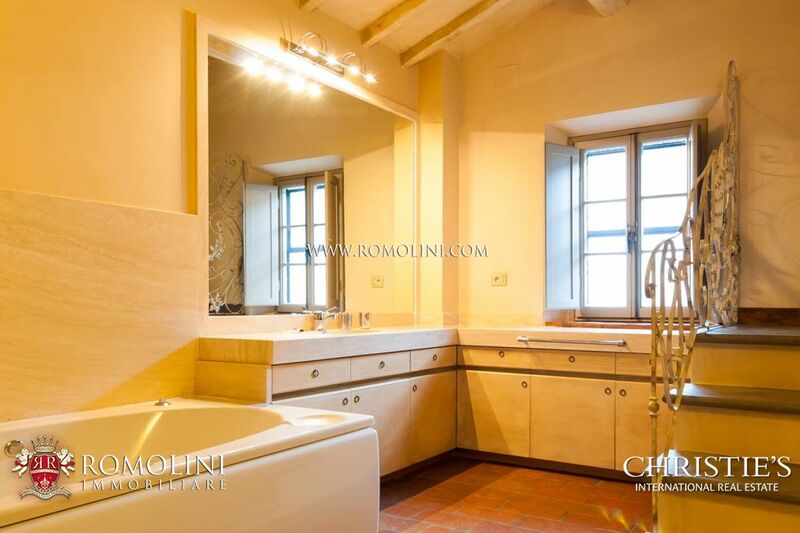 On the upper floor there are two bedrooms and two marble bathrooms. 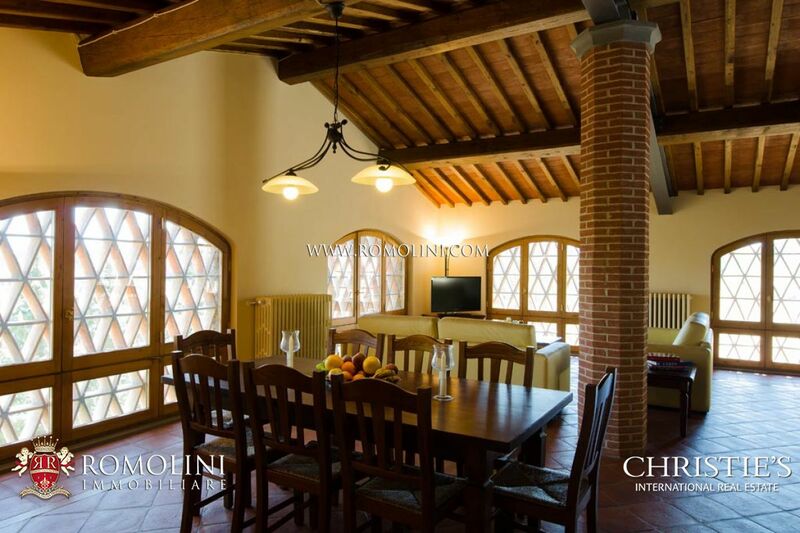 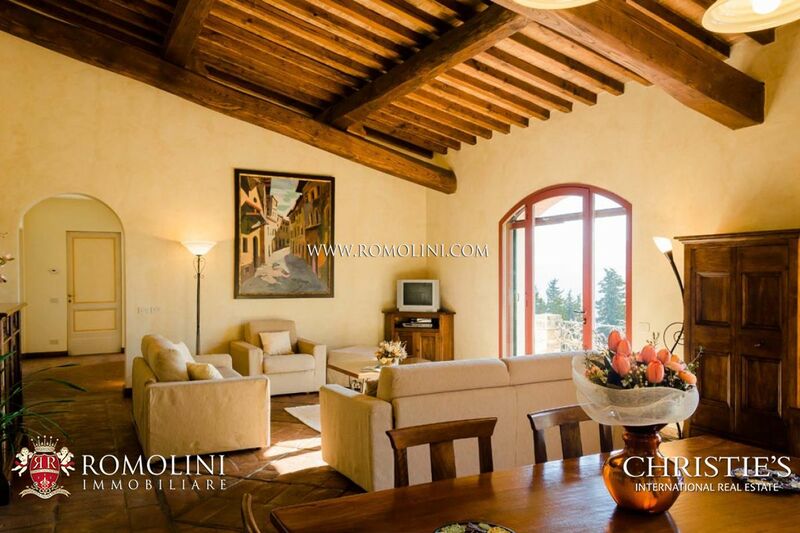 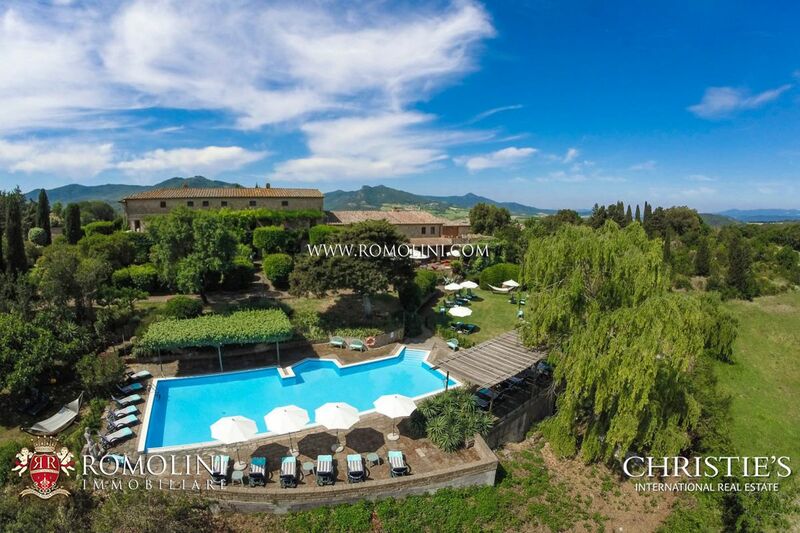 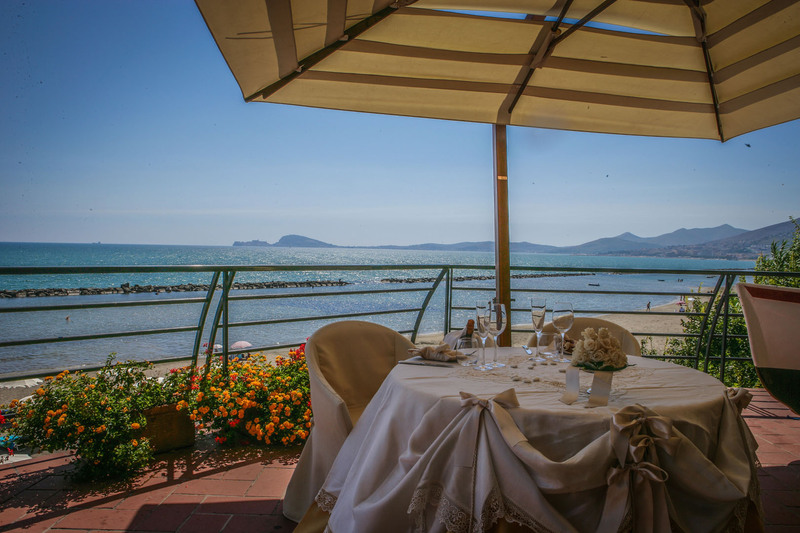 The villa and the apartments have been recently restored by Tuscan artisans and are in perfect conditions. 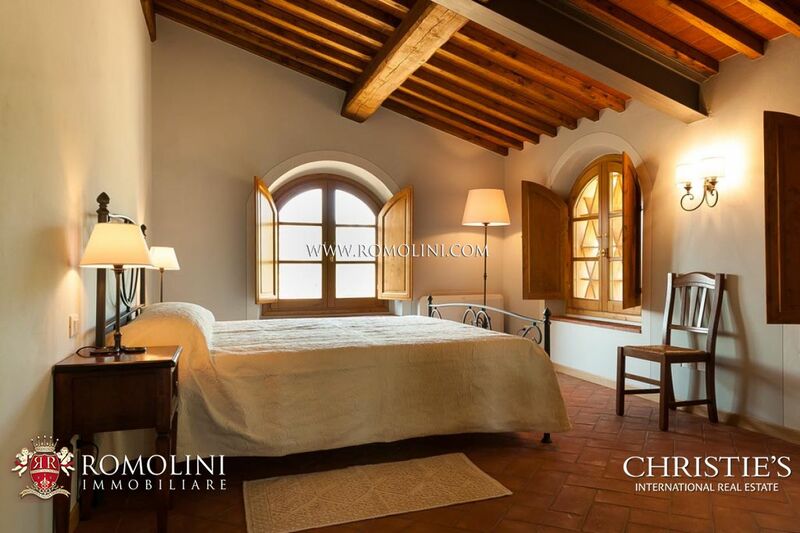 The buildings boast ceilings with wooden beams, original terracotta flooring, decorated and air-conditioned rooms, luxury furnishing, luxury marble bathrooms and air conditioning system. 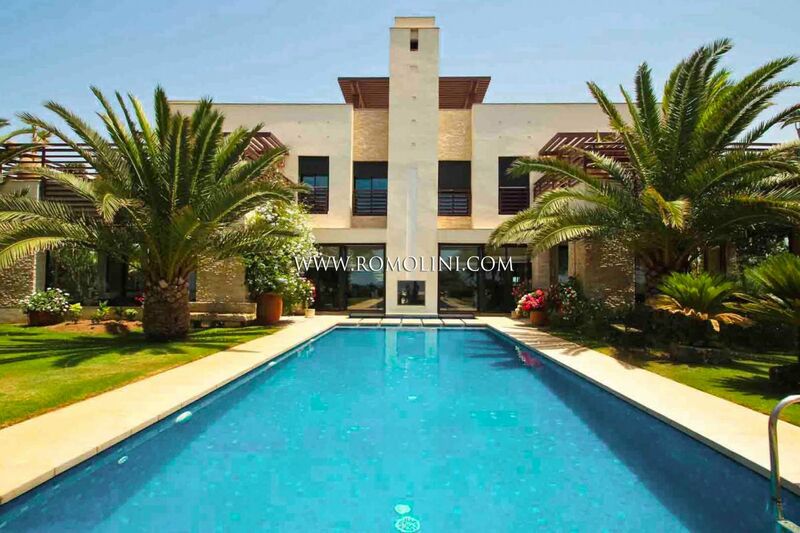 Inside the property there is also a pool. 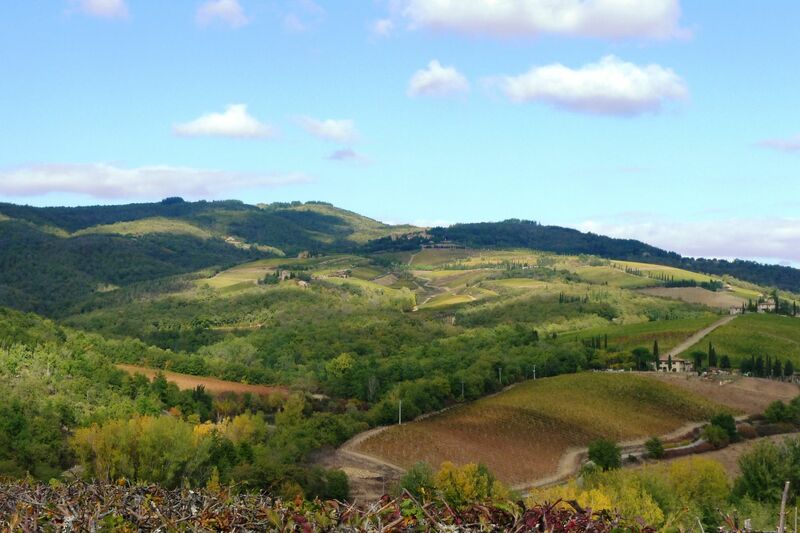 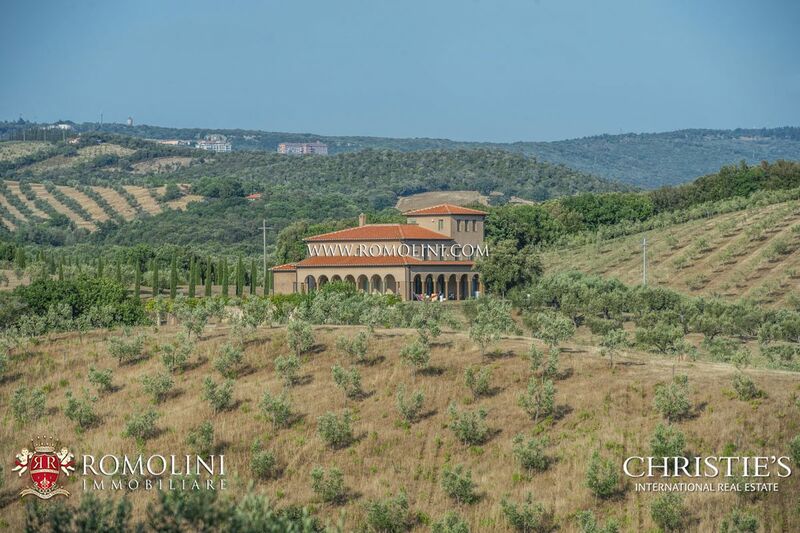 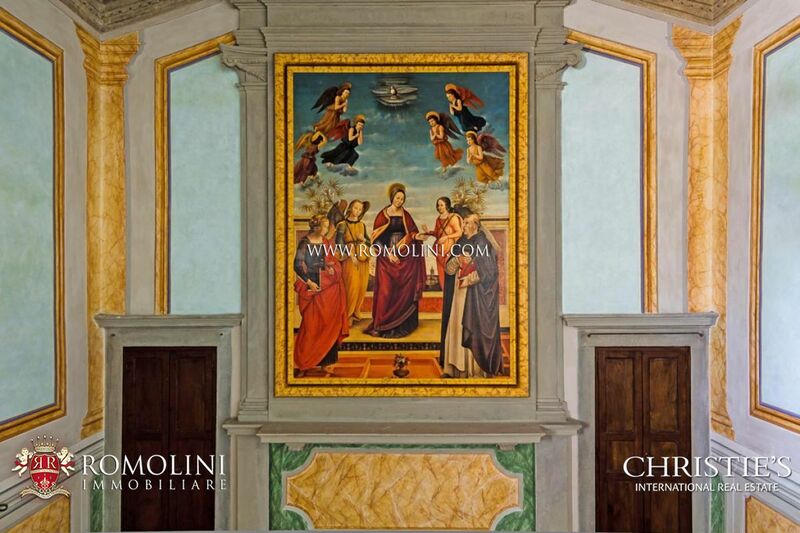 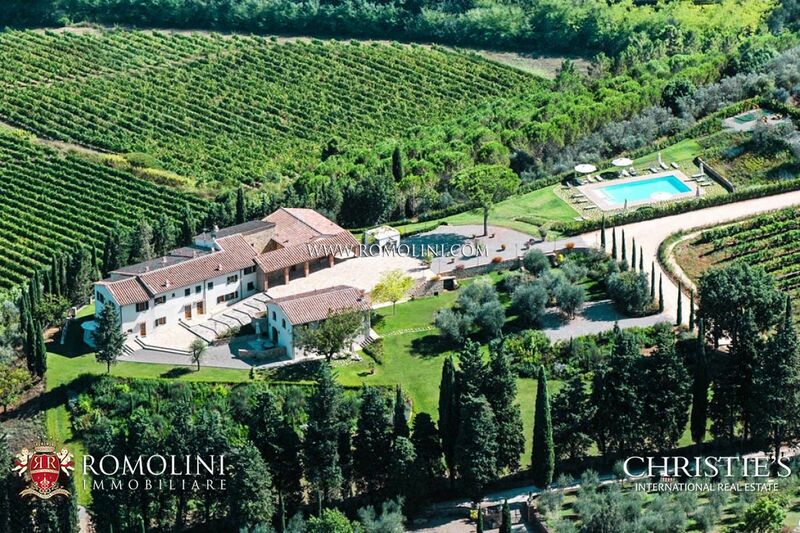 The estate is suitable for every use and is ideal to breathe the magical atmosphere of the Chianti Classico. 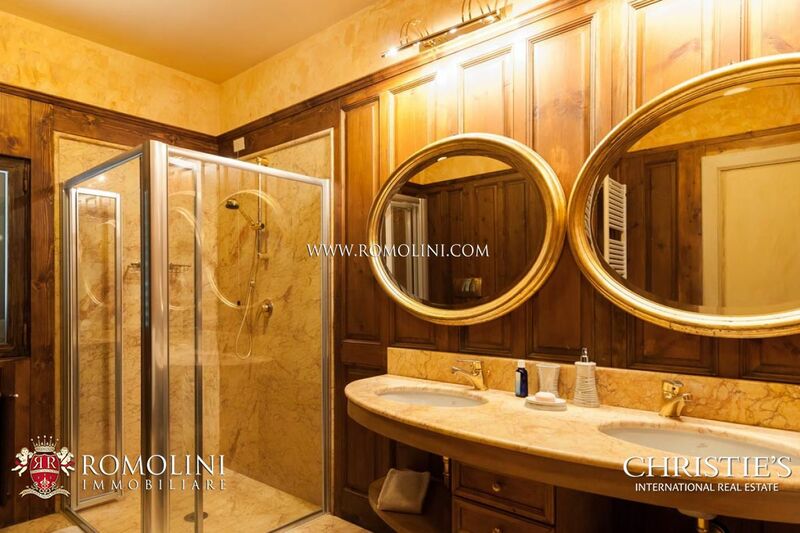 It is possible to create a SPA or spaces dedicated to sport activities (tennis courts, gyms and paths).